. : electronic components, optoelectronics, displays :. 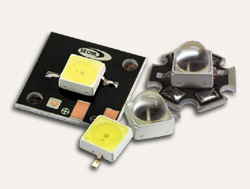 Z-Power LED P1 series is designed for high current operation and high flux output applications. Z-Power LED's thermal management perform exceeds other power LED solutions. It incorporates state of the art SMD design and Thermal emissionmaterial. Z-Power LED P1 is ideal light sources for general illumination applications, custom designed solutions, automotive large LCD backlights. Its superior high flux output and excellent thermal control makes the best solution for the outdoor lighting applications. Rectangular Type of P1 Series are suitable for specific design. Z-Power 1W series typically reach over 40lm at an operating current of 350mA and rated wattage 1.2W. Available in White, Red, Green and Blue either mounted on PCB or package itself. The 2.5 power series typically reach over 75lm at an operating current of 700mA and rated wattage 2.5W. Z-Power 5W series typically reach over 140lm at an operating current of 1400mA and rated wattage of about 5W.